Cleaning floors doesn't have to be a tedious chore. Once we hook you up with the right DIY solution for your flooring type, the rest will be easy. Sweeping dirt under the rug: Tempting, sure, but it’s no long-term solution. Different rooms in different houses require different levels of care, so only you can determine how often to clean. But we can tell you that homemade floor cleaner simplifies the task, somehow making it seem like much less of a production. In other words, when you clean with a homemade floor cleaner, it doesn’t feel like the sort of cleaning you know and dread. We think that’s largely because homemade floor cleaner contains no harsh chemicals; it’s completely non-toxic. It smells good, too—not in that artificial way, but genuinely good. Best of all, it’s cheap and easy to make and only requires ingredients that you likely have on hand. Here’s how to make special formulations for some of the most common floor materials out there. A popular recipe for cleaning and freshening hardwood floors includes the following: ¼ cup white vinegar, 1 gallon warm water, and a few drops of essential oil. When it comes to the oil, use any you like, or whatever you have, be it lemon or lavender or something else. While the vinegar disinfects, the oil adds a pleasing scent. Though it’s a forgiving formula overall, be careful to use the correct ratio of vinegar to water. If you fail to strike the right balance, the acid in the vinegar may damage the floor finish. When applying the homemade floor cleaner, do so with a dampened cloth or a mop with excess liquid wrung out of it. 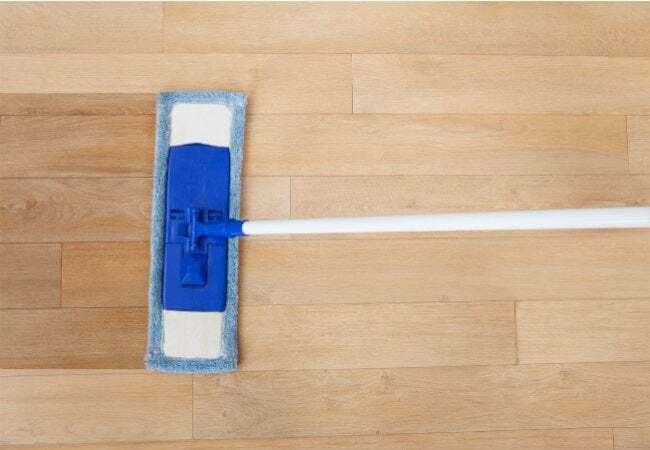 Before applying homemade floor cleaner to ceramic tile, remember to sweep or vacuum first. There’s a chance that, in the process of wiping or mopping, loose debris could scratch the floor surface. Once it’s free of bits and pieces, scraps and shards, proceed to mix the DIY cleaner. Combine ¼ cup white vinegar, ¼ cup baking soda, 1 tablespoon dish detergent, and 2 gallons hot water. Apply it either with a damp cloth or a wrung-out mop. After, go over it with fresh water, then allow to dry. The trick here is to avoid using any ingredients that might damage the vinyl. One safe bet is to mix together ½ cup rubbing alcohol, ½ cup vinegar, a few drops of dish detergent, and 2 gallons of water. The alcohol cuts through the really tough stains, while the detergent helps remove grease and residue. 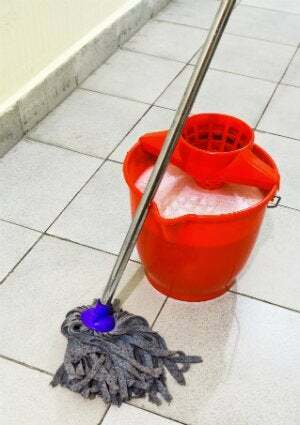 Mop the entire floor, then rinse with fresh water, if it seems necessary. If desired, you can also add a few drops of essential oil to infuse your home with a fresh-smelling aroma. Carpet cleaning can be a complex job involving a big machine or expensive outside help. But for a more casual approach, try this: In a spray bottle, combine a few drops of dish detergent, 1 tablespoon white vinegar, 1 cup warm water, and 1 teaspoon baking soda. After vacuuming, generously spritz the carpeting in one section. Then, using a clean towel, rub the solution into the stain. Now, use a different towel to absorb all the moisture. In this way, clean the entire carpet, section by section.